Sending email with Táve + Google's Gmail takes keeping track of your conversations with clients to a whole new level. When you add the Gmail integration, you will no longer be using Táve's email server (SendGrid) to send emails from the system. Instead, you're authorizing Táve to use your Gmail account. This integration works with both @gmail.com accounts as well as G Suite. To set up Gmail integration, simply go to the Integrations page in Settings and select Google from the dropdown to create your first Gmail or G Suite integration. You'll be asked to authorize Táve to manage your Gmail emails. You can add additional integrations for each Google user account you'd like to import messages from or send new email through. Once you authorize Táve to access your account, you will see all of the email addresses your Google account is authorized to 'Send mail as' (from the Settings › Accounts tab in Gmail). You'll be able to control whether other users in your Táve account can send email using your email addresses. 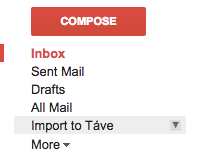 Note: any user you need to send email from Táve will need to be authorized by one of your Gmail integrations. You'll also be able to select the email address to use for each of your brands. Once you have all your settings in place, save your Google integration.